Remember the days when you didn’t have to get up to take care of living creatures in the morning? When school or work drove what time you had to wake up, but that was it? You could have variability in there. Hit snooze some mornings. Sleep in on weekends. Then came parenthood. And out went the snooze button. Being a parent is tiring. And oh what you would give for your child to sleep just that little bit longer in the morning! How do you get there? The first rule for getting your first morning wakeup time to a certain time is to be consistent with that time of day. You will want to be super consistent while you are establishing this wake up time. After the consistency is there, you can flex within 30 minutes on a regular basis and then flex further when needed. Just keep consistency the norm rather than the exception. Have breakfast at the time you want your child eating breakfast. This means if you want a 7 AM wakeup time, do not be feeding breakfast each morning at 6:30. There can, of course, be an exception to that. If you have a baby, your baby might not be able to make it to 7 AM. That is why I wrote a post for those 5-6 AM Night Wakings. Check that out for what to do. Along the same line of thought, do not get your child out of bed before the time you want to consistently start your day. I get it. You are tired. The day will come that you will just want to get your toddler up and stick her in front of the television so you can try to sleep a little longer. Don’t do it! Do not do it unless you want to do it the next day. And the next. And yet the next. And on until you finally decide that needs to go. Not only did he not let me sleep (because what toddler wants to sit alone watching TV in the wee hours of the morning? ), but he woke early the next day, too, even without the baby having woken at the same time. If TV was fun yesterday, it will be again today! That doesn’t mean you have to ignore your children. Since my mistake with Brayden, I have gone into my children’s rooms in those early morning hours and said, “It isn’t time to wake up yet. It is still night time.” Then I have tucked them back in and left the room. Do they fall back asleep? Sometimes. Other times they just lay there until it IS time to wake up. But they don’t start a new tradition of waking early each day. 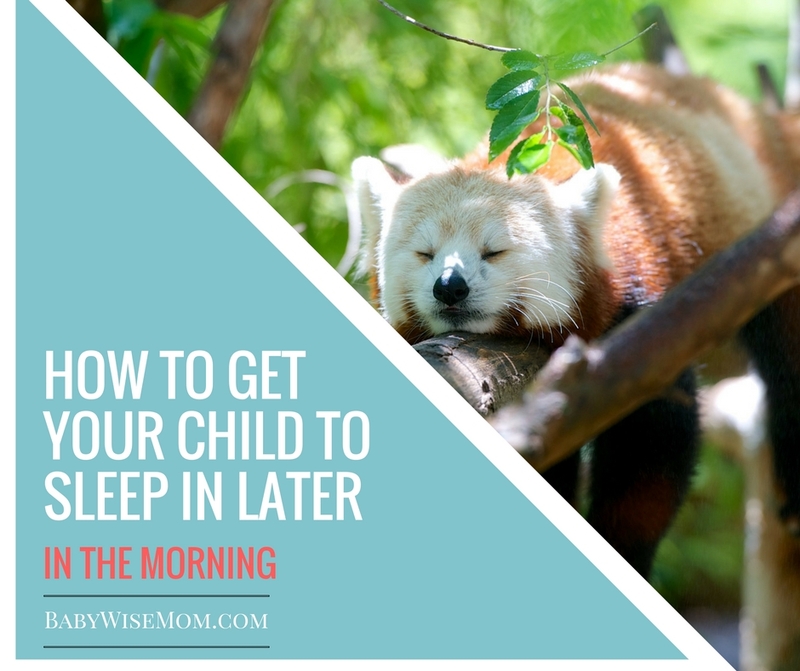 When I have a child waking before the best time of day to wake up, I like to slowly shift toward the preferred time. So if baby is waking at 6 AM and you really want 7 AM instead, spend a week having baby wait to get up and be fed until 6:15. A week later, move that to 6:30. Continue to move slowly until you have it to your desired time. You might have dreams of sleeping in until 8 AM each day, but dreams are not always reality. Brayden is 11, and I can count on one hand the number of times IN HIS LIFE that he has slept until the 8 AM hour. No kidding. I think two were this past summer. So work toward a time your child can reasonably attain. That time might shift over time. My third and fourth children shifted slowly to waking up later and later. So just because you are looking at 7 AM with a 3 month old doesn’t mean it is a life sentence (though it might!). Later nights do not lead a young child to later mornings. It leads them to earlier mornings. Or night wakings. It is an idea that backfires big time. Sleep Begets Sleep. A consistent bedtime is important. See Consistent Bedtime. If your child’s bedroom is above the garage, your husband leaves for work at 6 AM, and your child wakes at 6 AM each day, then you have a safe bet the garage is waking your child up. Be aware of environmental things that can be waking your child up. Noises? Get a sound machine. Too hot? Think of ways to get the room cooler. Too cold? Put your child in an extra layer of PJs. Be aware of the environmental factors. 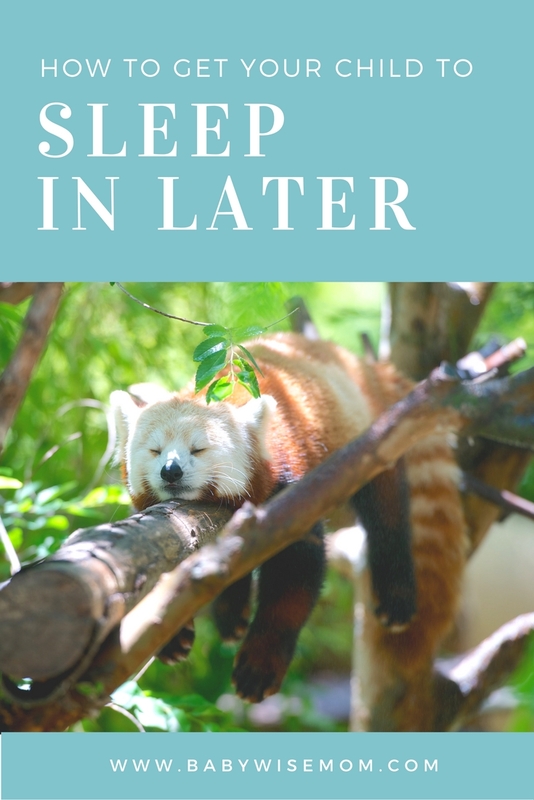 See my post on Optimal Sleep Temps or Dressing for Sleep for help figuring this out.